Today, American Airlines announced that it could cut 900 flight attendant jobs in the near future due to cut backs in flights. In addition to the flight attendant jobs, mechanics are the next on the list to be reduced along with pilots. American Airlines stated today that it feels mechanics are redundant corporate overhead as they haven't inspected or repaired a plane in years. In the future if American Airlines decides to start repairing and inspecting planes again they may bring back the furloughed mechanics if they can pry them away from their better paying jobs with less stress and job security. Additionally, American Airlines will begin a test program where they replace all their flight attendants with Coke machines at the front of the plane. 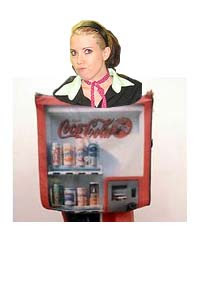 The program is in development now as the company has to work with the vending machine industry to develop a Coke machine with a crappy attitude as to not confuse the customers on the plane which are used to dealing with flight attendants.